Ingredients like edible insects are making their way into mainstream cuisine. Edible insects — which are part of the traditional diet of an estimated two billion people around the world according to the United Nations — are creeping into mainstream American cuisine, and closing in on Philadelphia. Take the chapuline, for instance. Sold at open air markets and at concession stands across Latin America, this small grasshopper is actually a field pest. It’s harvested as both a source of income and nutrition. But the chapuline is also a comfort food, particularly in and around Oaxaca and Puebla, Mexico. Philadelphia is home to a thriving Latin-American community, many of whom hail from these regions of Mexico. Chef Lucio Palazzo of Manayunk’s Taqueria Feliz first tried the popular snack five or six years ago at Xochitl in Society Hill. He had them again in a soup during a trip to Mexico and remembers the salty, earthy, grassy, almost truffle-y flavor. 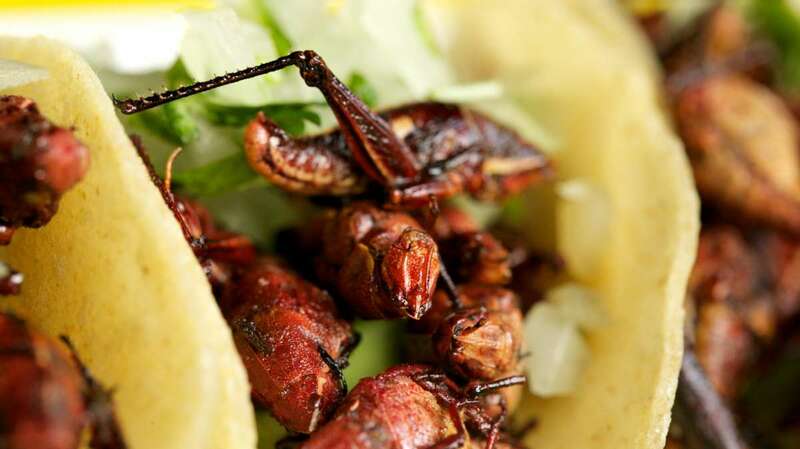 Traditionally chapulines are toasted with garlic, lemon and oil to unlock the nutty flavor. 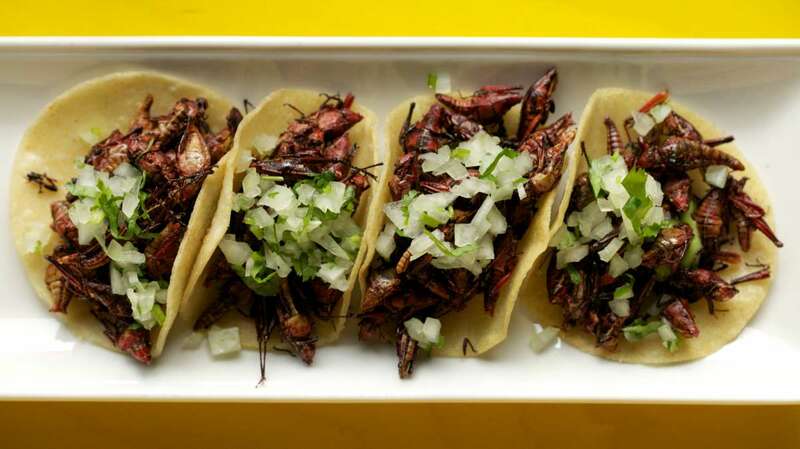 Years later he decided to put them on the menu at the approachable Philly taqueria on Main Street and is now selling 20 to 30 orders of “Tacos de Chapulines” a week, at $6.95. 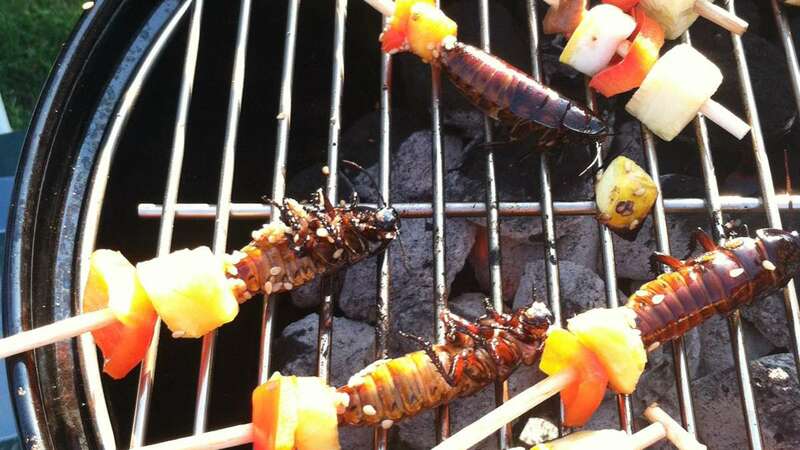 In a town with a food scene sometimes criticized as vanilla, a plate full of grasshoppers can spark up a conversation. After a quick toss in the frying pan with garlic and oil, the Latin-born hoppers get placed in palm-sized corn tortilla topped with a smear of guacamole and a sprinkling of diced onion and cilantro. A squeeze of chili-coated lime and it’s off to the races. I picked up my first grasshopper taco and took a bite. My mind’s eye saw them in there. Grasshopper heads rolling around my mouth, brushing up against my teeth and tongue; like a washing machine of insects. After the initial discomfort had passed, the flavor and texture of the dish I was served began to emerge. And it was… good. They were crispy and salty and could have inconspicuously passed for any number of things without a cringe. I finished my taco in another two bites; I even picked up a straggler from the plate and tossed it in my mouth, crunching it up ever so proudly. It was the first time I’d been served an insect, but I have a feeling it won’t be the last. For the folks at Mt. Airy’s Weavers Way, edible insects are nothing new. Bergman is currently testing out samples. Some come in freeze-dried pouches. Others come in cans. Bergman is still hunting for just the right products, including live varieties. The market is still very much untapped and unregulated. The United Nations found that only some of the edible insects making it to countries like the United States and Canada require any safety testing. Though with only a few exceptions, international trade in insects is still seen as insignificant. There are only a handful of notable restaurants serving insects — mainly on the West Coast and New York. Here in Philly, Palazzo is holding the torch. But an event last year in honor of the Big Bugs exhibit at Chestnut Hill’s Morris Arboretum offered what no one else in the city was doing. Chef Josh Hunter of Company’s Coming Catering was recruited to orchestrate the menu. He did some digging, researched the history, flavors and availability of different edible insects, and built a menu around the concept. Sourcing mainly from a Louisiana insect farm, Hunter was able to put together a menu of organic appetizers —cricket fritters served with a coconut dipping sauce; silkworm summer rolls in rice paper wrappers; a grill-your-own giant hissing cockroach station; a bamboo worm bruschetta; and fresh cut steak fries topped with smoked mealy worms. Hunter admits that he is in no way an expert, or an entomologist, but his experience in sourcing and serving has set him apart from the rest. While the product cost is pretty comparable to chicken or shrimp, edible insects offer sustainability that traditional proteins can’t provide. Insects like grasshoppers, crickets, caterpillars, weevils, termites and stink bugs, those eaten most often in regions of Latin America, Asia and Africa, can help reduce environmental contamination and can literally be reared on human waste, though there is still much research to be done in that area, according to UN reports. They pose less risk of transmitting infections to humans compared to traditional sources of protein in America, the report said. They are highly nutritious and high in fat, protein, vitamin, fiber and mineral contents. So far the only drawback of eating insects can come from the possibility of dangerous amounts of lead or gastrointestinal blockages caused by excessive eating. And while Philadelphians are a far cry from self-inflicted stomach problems caused by excessive bug consumption, the lasting impressions left by chef’s Hunter and Palazzo suggest bugs may be here to stay.